Once I got back from NC, I was pumped up and ready to go! We are in the home stretch of this election, and with early and absentee voting already in progress, there is no rest for the RNC. I spent a good portion of my week making maps of congressional districts and voting precinct locations throughout the United States. It may sound boring, but it has been surprisingly fun and informative. I have also been spending a lot of time looking at public opinion poll data for my division, and making targeting recommendations based upon what I find. Since we were just coming off of the first Presidential debate, this was an awesome project! I am excited to do this again next week post VP debate! It may not sound like what I am doing is all that thrilling, but on a daily basis I am working with members of the RNC to compile information and make recommendations that will be used by campaigns throughout the nation. That is pretty cool, if you ask me! If I had one piece of advice for someone looking to do an internship, I would tell them to make the internship whatever they want it to be. I have learned in my 6 weeks here that I could have very easily sat back and just done the minimum amount of work required. However, I chose to approach my intern supervisor and ask for more work. Not only does it make the day go by faster, but it also shows that you are ambitious. It makes the staff in your office realize how determined you are to go above and beyond, and also that you are truly dedicated to the office. This also means that they are more likely to bring you in to help them with special projects. I can honestly say that I am getting a great deal out of my internship and I couldn’t be happier!! Last weekend I headed to NC to campaign for the Romney-Ryan ticket. We spent literally all day Saturday and Sunday knocking on doors and making phone calls. Throughout the state of NC, thousands of doors were knocked on and about 105,000 calls were made! That is pretty impressive if you ask me. For years, people have told me to work on campaigns while I have the time because they are just so rewarding. I now completely understand! The time I spent in various neighborhoods thought the Raleigh area, as well as my time in the victory office were truly exhilarating. There were so many dedicated people coming together in one place for one cause..and that was amazing. -The LOC currently has 7 off-site warehouses to store its overflow of resources. The library is currently going through the process of asking for funding which will provide at least 3 more of these storage facilities. -There are nearly 600 miles of shelf within the LOC’s three buildings on Capitol Hill. What do I do when my class is cancelled for the day? Go on an adventure, of course! Today I chose to spend my afternoon at the United States Botanic Garden. The gardens are just so beautiful and relaxing. It was certainly a nice break from busy DC. It’s official! I have a library access card for the Library of Congress. Now I get to spend my semester doing research in some of the most beautiful reading rooms I have ever seen. Not to mention, the number of available resources is pretty phenomenal. Who knew that I would ever get this excited about a library and doing research?! Mom, Dad and I came down to Washington a few days before I would actually be moving into my apartment. We thought that it would be a good idea to spend some time exploring the city. The first day we were down here, we walked around the neighborhood where my apartment is located. It just so happens that I live right around the corner from the Capitol! I get to walk by it each day on my way to work. In fact, I get to walk by the Supreme Court and the Library of Congress too. Kind of a nice commute, if you ask me! My office is only about five blocks away, so it makes for a nice walk every morning. We then spent our second day doing some sight seeing. We took the metro into Foggy Bottom and explored the area around George Washington University. We walked through much of the National Mall, and saw many of the monuments and memorials. We began at the Lincoln Memorial, and then meandered through and saw everything from the WWII Memorial, to the Vietnam War Memorial, to the Washington Monument. Finally after a couple of days of exploration, it was time to move into my apartment! 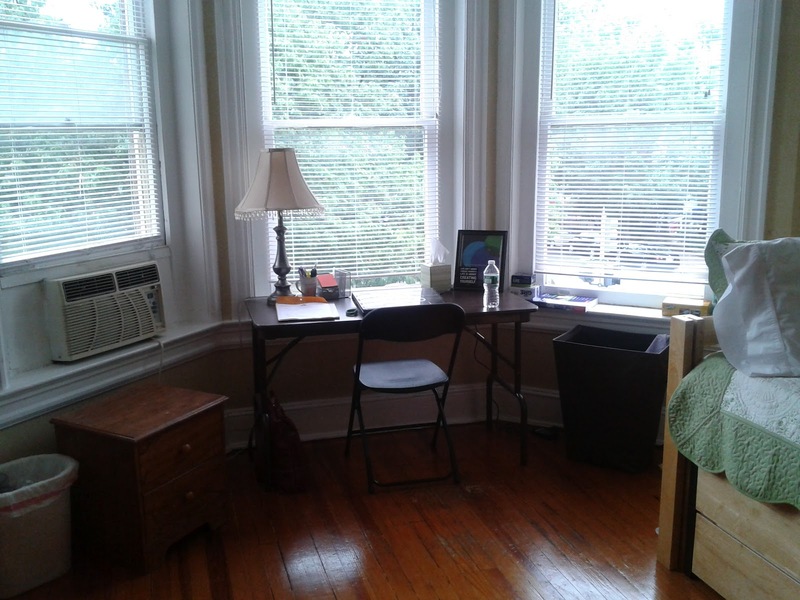 I am spending my semester living in a beautiful brownstone right on Capitol Hill. Since we are so close to all of these ‘important’ buildings in Washington, there is always activity. So far, my neighborhood seems great! 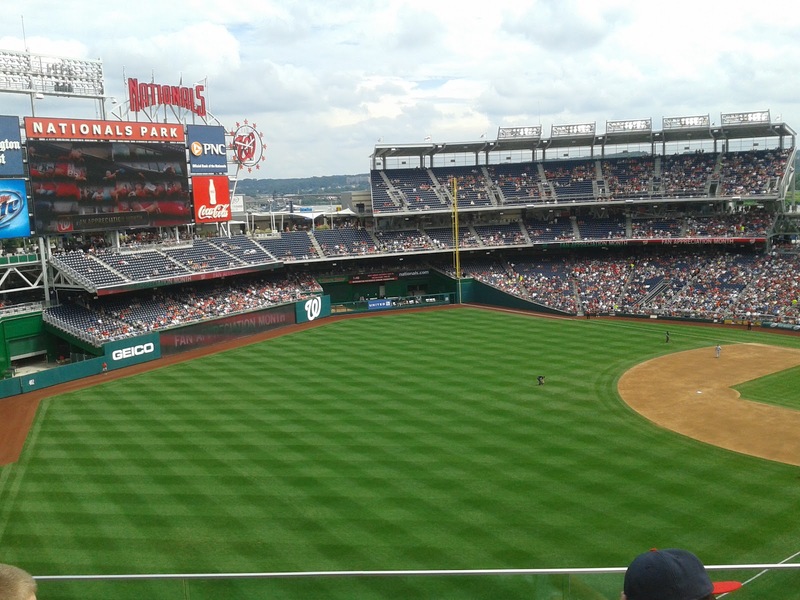 When I moved in, I found out that there would be ten other people living in the house with me, most of them being from Illinois.Therefore, when they heard that they could get $4.00 tickets to see the Cubs/Nationals game on Labor Day, they thought we should go. 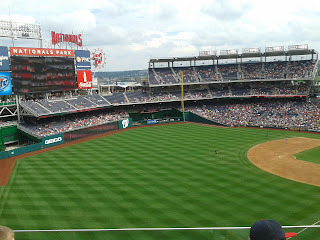 It was my first ever major league baseball game, and it was so much fun! After we all spent a few days exploring the city and getting to know one another, it was time to begin our internships. I began bright and early on Tuesday, September 4th. When I arrived at the Republican National Committee, I was taken to get my ID (I feel so official! ), and then to a brief orientation. During orientation I was able to meet some of the other new interns for the fall semester. There were a few other people from NY, so that was pretty exciting! Once orientation concluded, we all went off to our respective divisions at the RNC to begin working. I had selected to work in the strategy division. When I arrived they told me I would be working specifically on elections and mapping. I wasn’t sure exactly what that meant, but I soon found out that I would be collecting lots of county-by-county election data, compiling that information, and also using that data for future mapping projects. The first week was a bit slow, as everyone in my office was in the process of returning from the Republican National Convention in Tampa. However, I have stayed consistently busy every since. On the surface, my job does not sound that thrilling, but I am loving it. It is great knowing that the work I am doing really matters. This data is used by many people both as a reference, and as a way of targeting registered voters. Well, I think that is enough information for the time being. There has been so much going on, and there is no way that I would ever be able to fit it all into this one post! I am excited to be documenting this adventure, and I can’t wait for you to read all about it. I will be sure to update you all soon! Back to the North Country! up to this computing class. The first week of classes was filled with excellent on-campus events such as a dorm room essentials sale at the college store, open mic night at Hurley’s nightclub, and a performance from comedian Eric O’Shea last Friday night. The first weekend was also host to First Saturday, a huge block party in the middle of town, that was hosted by both SUNY Potsdam and Clarkson University. There were live bands, local vendors, free sundaes from a local scoop shop, and plenty of students having a good time. Coming up to Potsdam as a Freshman can be a little daunting at times, but the campus and local community do everything possible to make the transition to college life as fun and easy as possible. With the semester underway, and plenty of homework to keep me busy, I feel right back into the swing of things. This is my senior year and I’m doing an internship at the college library’s archives, an experience I’ll surely chronicle on both this blog and my personal one, taking my second graduate level literature course, and completing an honors thesis. The thesis project will take me to Harvard’s Houghton Library to do archival research on a relatively unknown author by the name of Dr. Thomas William Parsons, a translator of Dante’s “Inferno” few scholars have researched. I can’t wait to blog about that experience and share some pictures of the trip to such a renowned library. This semester has a lot underway and plenty to offer, it feels great to be back. See you this year on the SUNY Potsdam blogosphere! These past two weeks of strenuous schoolwork is showing me that productivity can sometimes mask itself as stress. Deadlines fall out of reach, things pile up, but the most important thing is to keep chugging through and all those piles of assignments will eventually get out of the way. Between the papers and projects, I’ve been gearing up for Springfest, Earth Week, and the Lougheed-Kofoed arts festival. I’m pumped to see Streetlight Manifesto on Saturday night and then stick around for the WAIH’s rave afterwards. Believe it or not, this year’s spring fest will be held outside the union facing Barrington Drive. The whole street will be closed off for events all weekend. It’s going to be awesome! Next week, our very own campus sustainability office will be hosting earth week in collaboration with the student activist organization Middle Ground club. I’m interning for the sustainability office right now as their social media representative and will be covering a few events for them. An event I’m really looking forward to covering is a talk from author of The Big Thirst, Charles Fishman. It’s a privilege to get him on campus and in lieu of a great non-fiction author we are also going to have radio host Grant Barrett from NPR news. He will be delivering a talk on grammar, which is the subject of his talk show, and answering questions from the audience. I’ve been offered to have lunch with him, too! There are so many other events taking place next week that it’s almost overwhelming to list. Luckily, it’s all in good fun and a nice break from the books. Can’t wait for the festivities to commence!